We are typically selling displays to serve a specific purpose: information, entertainment or branding. Our branding installations are typically in retail environments and they are mostly the same, a video loop of a product or logo on a video wall or large projection screen. The Planar Mosaic Architectural Video Wall literally breaks the mold, giving integrators the opportunity to create a completely custom dimensional video wall sculpture. Sure, any creative designer could arrange displays in a unique configuration but Planar has thought this product through with three display shapes and sizes as well as an online design tool. 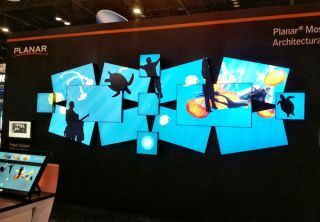 I was able to spend some time with the online design tool in the booth; dragging, rotating and dropping displays over an image to create my perfect video wall sculpture. There was a lot more to like in the Planar booth, and anyone who has had to disassemble a section of a video wall due to a broken power supply will appreciate their remote power supply solution. It simplifies installation and moves this common point of failure from behind the display and into the rack room.